Royal Enfield has finally started offering ABS brakes on their motorcycles. And those who have used ABS for the first time on RE, are surprised. Royal Enfield launched the all new Classic Signals 350 motorcycle last month. This went down in the history as the first Royal Enfield in India to come with dual channel ABS as standard. Now, within two weeks of the launch of Classic Signals 350 ABS, the company has added ABS brakes to Himalayan and Classic 500. Entire RE range will be getting the ABS brakes in the coming weeks, including the Thunderbird and Bullet range. So how does the ABS improve braking system on a Royal Enfield, which has been known for having really bad brakes. Well, for starters, one owner of Classic 350 Signals has went ahead and posted a video about his experience of ABS on a Royal Enfield on a video. 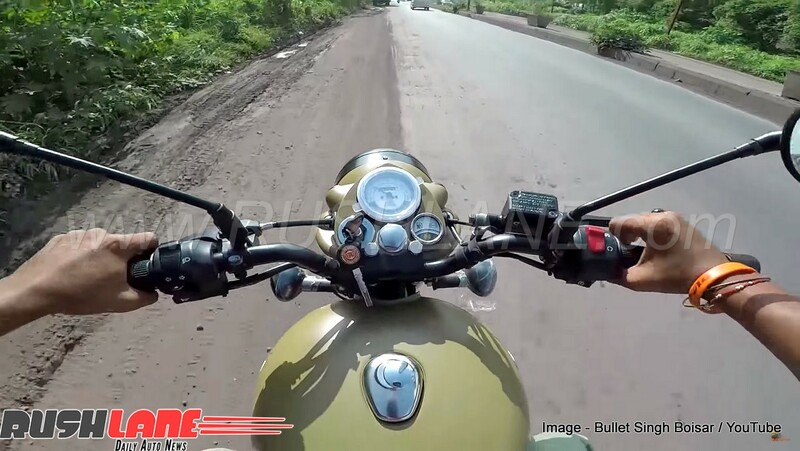 You can watch the Royal Enfield Classic 350 ABS brake test video below, which has been created by Youtuber Bullet Singh Boisar. Priced from Rs 1.62 lakhs ex-showroom, Royal Enfield Classic 350 Signals Edition is also seen with a list of additional accessories which include a pannier, engine guards, touring seats and a tall windscreen along with rear luggage racks and cast aluminum wheels. Royal Enfield is also offering apparel such as helmets, riding boots and jackets all in the same color scheme for this special Signals Edition. In terms of engine specifications, the Royal Enfield Classic 350 Signals Edition gets powered by a 346cc, single cylinder, air cooled engine offering 19 bhp peak power at 5,250 rpm and 28 Nm torque at 4,000 rpm mated to a 5 speed transmission. Suspension is via 35mm telescopic front forks and twin gas charged shock absorbers at the rear while braking is through 280mm single disc in the front and 240mm disc at the rear. ABS is standard. The launch of ABS variants of Royal Enfield motorcycles has upset the owners of Pegasus 500, which are the most expensive RE motorcycles till date. These do not come with ABS. But that is not the reason Pegasus 500 owners are angry. They are angry because as per the owners, RE announced Pegasus as a limited edition motorcycle. But soon after seeing its success, launched a cheaper 350cc variant which looks exactly same as the Pegasus 500. One Pegasus 500 owner, Rajni has gone and deposited the bike back in the Royal Enfield showroom. Two owners have gone and clicked pictures of their RE Pegasus 500 in garbage dump. Many have mailed RE, awaiting for some response. But, they are yet to get any satisfactory response from the company.